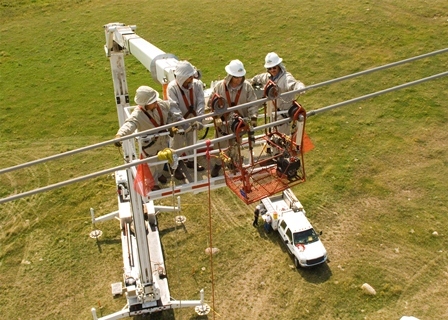 Linemen at work. Photo courtesy of Basin Electric Power Cooperative. The North Dakota Transmission Authority was created by the state legislature in 2005 to “facilitate, finance, develop and acquire” transmission in North Dakota. Various projects continue in and around North Dakota in electricity transmission. Construction continues on Basin Electric Power Cooperative’s 345-kV transmission line that will stretch 200 miles from the Antelope Valley Station near Beulah, N.D., to substations near Grassy Butte and Williston, N.D., and end near Tioga, N.D. This new 345-kV line will help meet increasing regional electric demand and improve the reliability of the existing system, strengthening the electric infrastructure throughout the region. By the end of 2016, 170 miles of this line were completed and energized. Remaining segments are expected to be completed by 2017. The cooperative is building an additional 60 miles of 345-kV transmission line and three new 345/115-kV substations, scheduled to be operational by the end of 2017. Otter Tail Power Company and Montana-Dakota Utilities Co. are jointly constructing the Big Stone South to Ellendale Transmission Line. Construction on this 163-mile project kicked off in September 2016. When complete, this 345-kV line will connect the new Big Stone South Substation near Big Stone City, S.D., to the new Ellendale Substation near Ellendale, N.D. Construction is set to be complete late in 2018. In September 2016, CapX2020 utilities energized the final segment of the Hampton-Rochester-La Crosse transmission line. Its next project in eastern South Dakota is scheduled to be completed in 2017. CapX2020 is a group of 11 Midwest-based utilities constructing more than 700 miles of new 230-kV and 245-kV transmission line as part of the largest electric grid expansion to touch the region in decades. The line represents an investment of nearly $2 billion and was constructed to ensure continued reliable, affordable electric service to Minnesota, Wisconsin, and the surrounding area while expanding access to renewable energy. Xcel Energy partnered in early 2017 with the Federal Aviation Administration to further study safe operation of unmanned aircraft system (drone) technology to inspect transmission lines for damage. Xcel Energy has been working the past few years with the University of North Dakota and other partners to conduct test flights in North Dakota using two types of drones – a large, high-altitude drone and a low-altitude drone. Research will be conducted for 18-24 months and include inspection of more than 20,000 miles of transmission lines in Texas, Minnesota, South Dakota and North Dakota. Transmission costs vary depending on voltage, terrain type, right-of-way costs, and many other factors. Average transmission costs for a new 345-kV line can be $1 – $2 million per mile. In October 2015, Basin Electric Power Cooperative joined with the Western Area Power Administration’s Upper Great Plains Region and Heartland Consumers Power District to join Southwest Power Pool. By doing so, they transferred functional control of the integrated transmission system to Southwest Power Pool and began operating in the regional transmission organization. Southwest Power Pool spans nearly 575,000 square miles in all or parts of 14 states in the central U.S. and includes more than 800 generating plants, nearly 5,000 substations and about 56,000 miles of high-voltage transmission lines. The remainder of the state’s power grid is in MISO (the Midcontinent Independent System Operator).